A ceremony to break the ground has been staged at the site of a planned immigration removal centre at Gatwick. 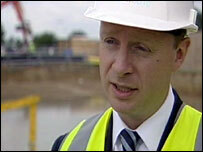 Immigration Minister Liam Byrne visited the site where the Home Office plans to open a new 426-bed detention centre. Mr Byrne said: "Building this new removal centre... sends a very clear message to those here illegally. We'll do everything we can to send you home." In April protesters in Crawley, Sussex, called for the holding of asylum seekers in secure units to stop. The three-storey building - called Brook House - will be within the airport's boundary fences, and is due to open in 2008. The unit will be surrounded by a 5.2m (17ft) security fence. A visitor centre and a gatehouse are also planned. Tinsley House, which is currently situated at Gatwick, holds 135 people. During the demonstrations earlier this year, people waved banners with slogans calling for all immigrants to be freed from secure units, and stopped traffic in Crawley during their march. There are currently 10 removal centres in the UK with 2,545 places in total.